Education support to a Kid is a big smile into new life! Rubanda Solidarity invests its energies to provide "Quality Education" to kids. This means integral education that includes safe environment for kids, provision of basic needs and offering needed spiritual and academic education. Our kids are not fortunate in the same way. Some enjoy their parental affection because they have the chance to see their parents though stricken by poverty to provide them with what they would need. Others have no chance to enjoy either of the parents, and other do not even recall the face of their both parents. Its sad to grow in a such environment. How ever, God provides a way through. 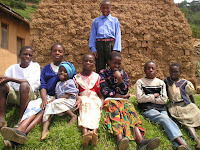 In 2002, Rubanda Solidarity management team, initiated "Child Education Support Program". This program aims at building solidarity with both local and international friends to the sole interest of orphans and vulnerable kids in the community. The project began with one family, another miracle, of Italian origin adopting at a distance two kids. Since then a string of generous people are building up a strong force supporting more than fifty kids through child education support program project through distance adoption. Its amazing to see a project that began in 2002 now has a graduate daughter, two in high school and over forty kids in primary level, all at a distance adoption program by our solidarity friends. Our kids are great and intelligent but badly started by poverty. Would you like to pull one out of it? Subscribe for more information now.